You are here: Home / CELEBRATIONS / Easy St. Patrick’s Day Menu with Cabbage Brussels Sprouts Salad! Easy St. Patrick’s Day Menu with Cabbage Brussels Sprouts Salad! Not sure what to serve up yet for your St. Patrick’s Day menu? I am here to help with some really simple ideas that make hosting a St. Patrick’s Day party for your friends and family easy and fun, including a crunchy Cabbage and Brussels Sprouts Salad that makes the BEST green salad for the holiday! 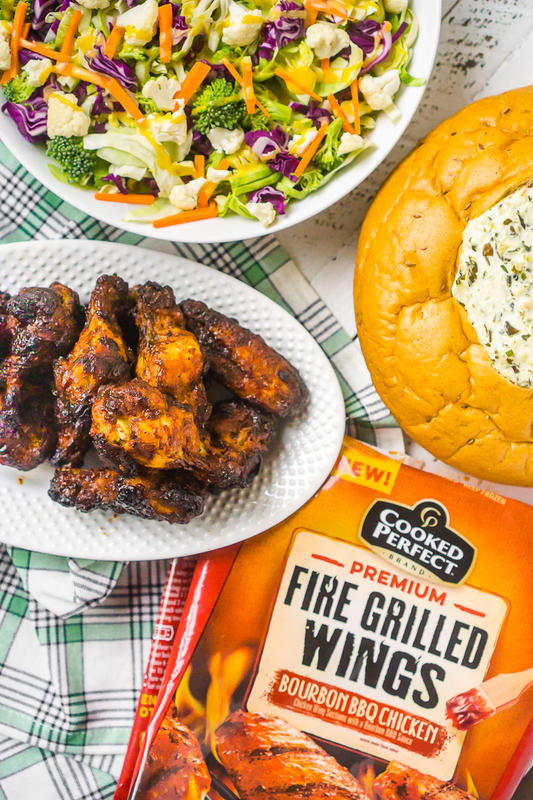 A Delicious St. Patrick’s Day Spread with Cooked Perfect® Fire Grilled Chicken and a Brussels Sprouts Salad with Cabbage, Carrots, and more! Growing up, we never did anything special for St. Patrick’s Day, and we definitely didn’t have any St. Patrick’s Day recipes that mom made. Really, we wore a little green to avoid a pinch and that was about it. Then I married my husband who comes from a very proud Irish family! We love any opportunity to have friends over, and let’s be honest – Bryan never turns down an opportunity for good food and a cocktail. But here’s the thing – March is a crazy busy time for us. We have birthdays galore, an annual work trip for Bryan, family obligations including a trip down to St. Louis for me, and more! So while I am up for a fun St. Patrick’s Day food spread and fun time with friends, it needs to be something easy and simple. 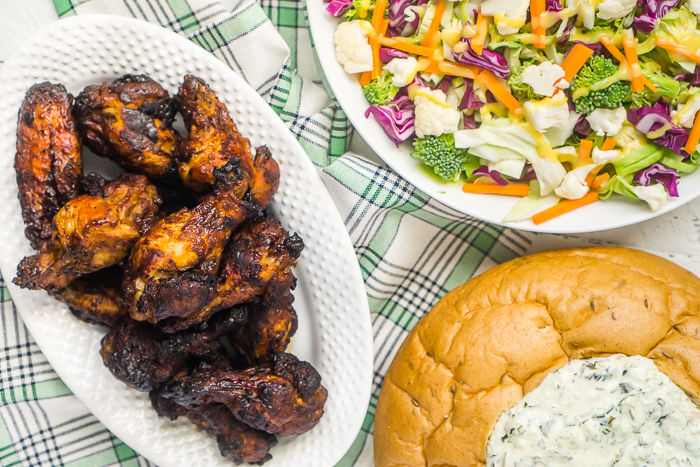 Chicken wings are an easy way to make my husband happy, so I decided to create a St. Patrick’s Day meal around wings. To make it happened quickly I turned to Cooked Perfect as I’ve done many times before, including Korean BBQ Meatball Chow Mein and Sundried Tomato Chicken Meatball Linguini. Cooked Perfect Fire Grilled Chicken is grilled over an open fire which locks in amazing flavor for juicy, tender chicken. You get grilled perfect chicken without the work, which is especially important here in Chicago in March because we’re not normally in grill weather yet. That doesn’t normally start happening until May. 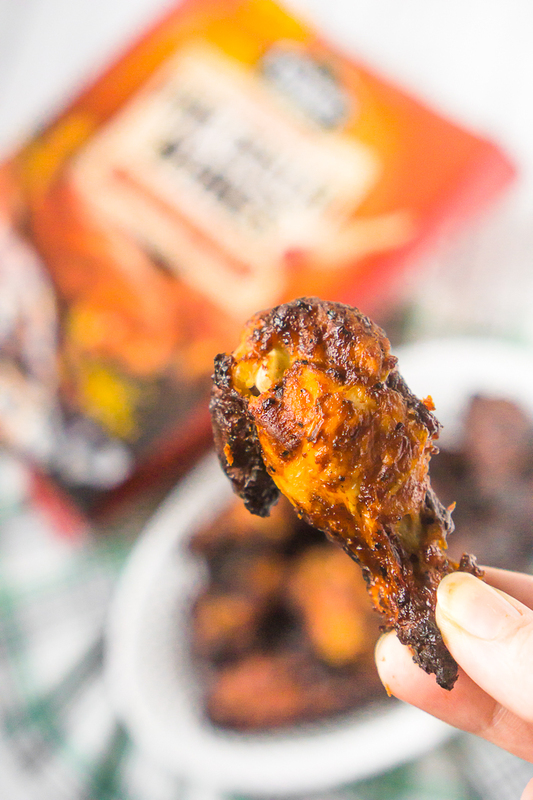 Cooked Perfect Fire Grilled Chicken comes in a variety of cuts – wings, drumsticks, thighs, tenders, and chunks. PLUS you have a ton of bold flavors to choose from: Bourbon BBQ, Buffalo Ranch, Wildflower Honey, Lemon Herb, Zesty Herbs and Spice, Szechuan Style, Korean Style, and Classic Style. Everyone can find something they will love and their family with love because there are just so many choices! AND you can cook them in the microwave or the oven, which is my preferred cooking method. You seriously need to head to the frozen foods aisle and check these out! You can find a store now PLUS you can Browse Recipes & Save $1.50. When I brainstorm an appetizer style food spread, I like picking one item that is a little more meal like so our guests feel more full and satisfied. I love carbs, but I can’t survive on them alone. Adding a good protein in the mix is good for everyone, and I already knew I wanted to make Bryan happy with chicken wings. 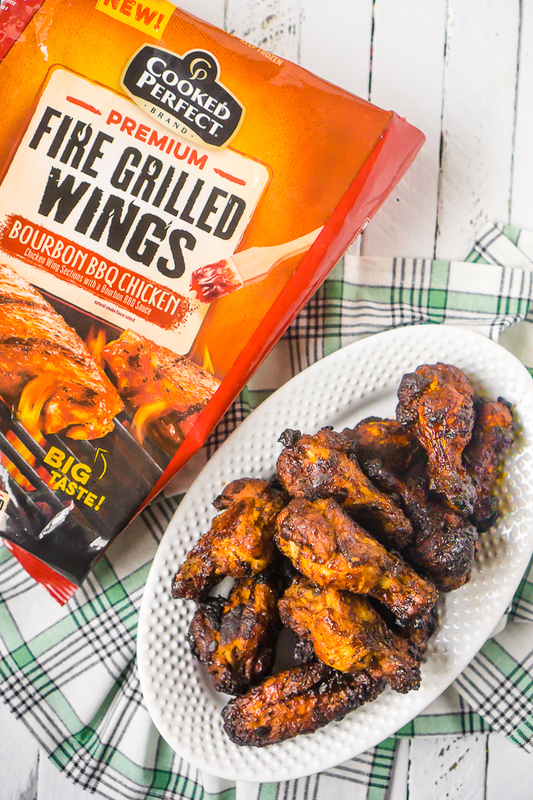 I decided to make Cooked Perfect Fire Grilled Chicken Wings in Bourbon BBQ the centerpiece for our St. Patrick’s Day meal. While not Irish whiskey, it felt like a whiskey inspired BBQ sauce made a nice little nod to some traditional St. Patrick’s Day flavors. Going from there, I knew I wanted a really pretty green salad using vegetables that are in line with Irish food, so I went with a chopped Cabbage and Brussels Sprouts Salad with broccoli, cauliflower, and carrots. It was really light, pretty and crunchy, which I love! It also gives your spread a much needed dose of vegetables. Since I want to be able to put this salad out for people to enjoy as it pleases them, I did not toss the salad in dressing. Instead I just put a few choices out for guests to choose from. A nice honey mustard is definitely my preference for this salad! To add a little more green to the spread because it is for St. Patrick’s Day after all, I cut out the middle of a hearty rye bread and scooped in some spinach dip. We also do this regularly as a family with dill dip! Lastly, I decided we needed to add some potatoes to the mix for this spread and added yummy potato skins! I mean, who can say no to potato skins? I definitely can’t. The thing that I love about this spread is that it is easy to snack and graze on which is perfect for us as we don’t plan on sitting down to a formal dinner on St. Patrick’s Day. However, it also feels like a complete meal. We’ve been to plenty of parties where after we only really ate carbs or chips and dips and felt hungry as we left. With an appetizer spread like this, you are getting a protein, a starch, vegetables, and some yummy carbs and dip! If you want ideas for a St. Patrick’s Day dessert to add to the mix, you will definitely want to check out my Mini Mint Oreo Cheesecakes or Mint Chocolate Truffles. They are my favorite truffles ever! Now, let’s make this Crunchy Cabbage and Brussels Sprouts Salad! 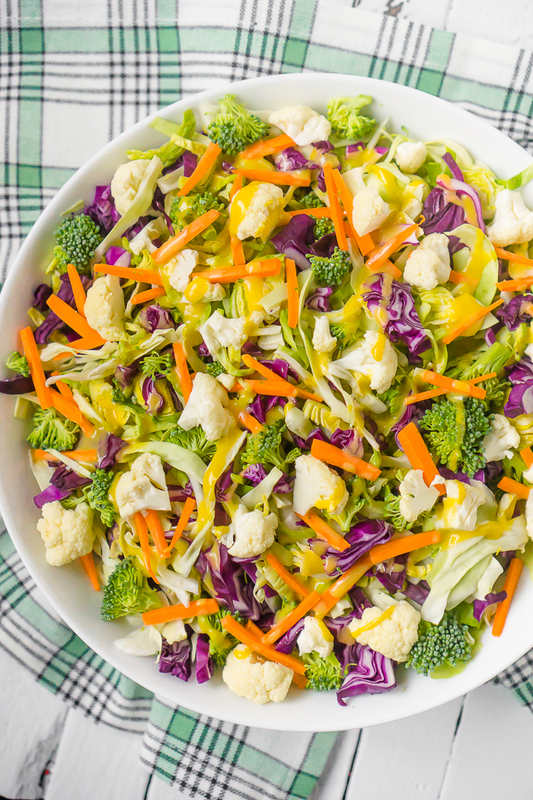 Crunchy Brussels Sprouts Salad with cabbage, carrots, broccoli, cauliflower and more! It's a gorgeous green salad full of vegetables! Place chopped brussels sprouts, cabbage, carrots, broccoli and cauliflower into bowl and mix. Toss with salad dressing of your choice or leave bare and allow guests to add their own dressing. We used our favorite honey mustard dressing. The Best Toddler Shoes for Constant Movers!